The 'St Ayles Skiffs' is a design commissioned by the Museum from renowned boat designer Ian Oughtred and are made from a plywood kit. It was inspired by the traditional Fair Isle Skiff. These reasonably priced kits can be purchased from Jordan Boats, partners in the project, with the Museum earning a royalty from each kit sold. Each skiff requires a team of four rowers and one coxswain to complete a full crew with each rower taking one oar. The 'Chris o' Kanaird' was the prototype boat built by Jordan Boats and purchased by the Museum. Use is given to the Museum's St Ayles Rowing Club to help encourage the community to join in and become part of this project and by visiting other coastal towns and villages to encourage them that they to can see the benefits for their community. The second Museum boat, the 'St Ayles', was built at the Museum by students and volunteers and completed exactly a year after the first giving the opportunity to have two boats out competing at the same time. The third, the 'Coull D' was built by the St Ayles Rowing Club. The club is part of the Scottish Coastal Rowing Association which started in 2010 to build up the coastal rowing sport by having inter-community regattas throughout Scotland. 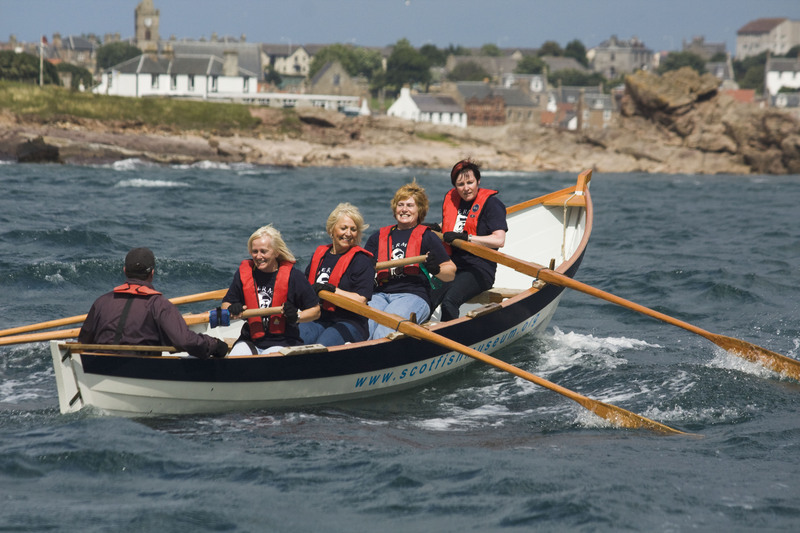 There have been a many of regattas held in Scotland from Portsoy to Eyemouth and with the increasing number of boats being built and even a St Ayles Skiff World Championship in Ullapool in 2013. Over 200 skiffs have been built now, including in the USA, Holland, Canada, New Zealand and Australia. If you would like to find out more about the rowing club or would like to come have a go then please visit the website at http://www.staylesrc.org.uk.